Metabolic Type® Report — your personalized report describing the results of your own Metabolic Typing Assessment. This report not only describes your personal Metabolic Type, but also shows the relative balances between the various systems that determine your type of metabolism. This allows you to compare future test results and chart your progress as you achieve better health through improved metabolic balance. 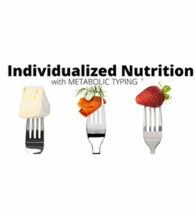 Personalized Metabolic Type Eating Plan — the heart of your Metabolic Typing recommendations. Your food list details exactly the right foods for your specific Metabolic Type and identifies all the foods you should avoid. Starter Meal Plans — to assist you in getting started right. Metabolic Typing is unique because there is NO food weighing or measuring required! With our Starter Meal Plans, you will quickly learn how relative food proportions are what really matters. Learn why you do not need to weigh food quantities or count calories to lose weight or improve your health. Individualized Metabolic Type Supplement List — the right nutritional supplements specifically created and combined only for your unique Metabolic Type. These supplements are unlike any others – they utilize the exact forms and balances of the vitamins, minerals, amino acids, fatty acids, herbs and enzymes shown to be supportive of your particular kind of metabolism.